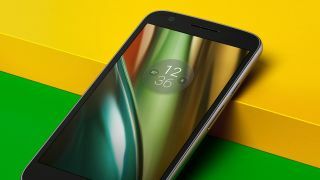 The launch of the Moto Z range hasn't meant Motorola has abandoned its affordable Moto E line, in fact the company has just announced the third entry in the series, dubbed the Moto E3. On paper it sounds like the new Moto E will continue in the footsteps of the Moto E (2015), with a rock bottom price and surprisingly solid specs. Here's everything you need to know about it, from what it will cost and when you can get it, to the specs and features. Motorola is launching the Moto E3 in early September. In the UK it will cost you £99 (around US$130, AU$170) and the handset will be available from Tesco, Amazon, Argos, O2 and other selected retailers. There's no news yet on the price or release date elsewhere, but we'd imagine it will launch at around the same time in other countries. The Moto E3 has a base color of black or white and a fairly plain back, with the usual Motorola dimple. It looks very similar to the Moto E (2015), albeit with a different camera design. It comes in at 143.8 x 71.6 x 8.55mm, making it quite a lot longer and wider but substantially slimmer than the 129.9 x 66.8 x 12.3mm Moto E (2015). It's slightly lighter too at 140.6g. The Moto E3 is also splashproof, with a nano-coating creating a water repellent barrier, helping it survive spills and light splashes. But this isn't full waterproofing we're talking about, so don't take it swimming with you. The new Moto E packs a 5.0-inch 720 x 1280 display with a pixel density of 294 pixels per inch. That's up from a 4.5-inch 540 x 960 screen on the Moto E (2015). It also has a built-in smudge-resistant screen protector, to help it keep clear of fingerprints. Motorola has stuck an 8MP camera on the back of the new Moto E, with an LED flash and video recording at up to 720p. There's also a 5MP snapper on the front and while there's no flash on this one it does come with a 'Beautification mode', to keep selfie fiends happy. That's a big upgrade on the 5MP/VGA pairing on the Moto E (2015), especially as there was no flash present there. The battery is a 2800mAh one, which according to Motorola will last a full day of mixed use. It sounds like you'll still need to put it through daily charges, but it's a lot larger than the 2390mAh one in the Moto E (2015). The Moto E3 has a 1.0GHz quad-core 64-bit MediaTek MT6735p processor and 1GB of RAM, which doesn't sound like much of an upgrade on last year's model, as that also had a quad-core chip and 1GB of RAM. But the Moto E3 runs Android Marshmallow, supports 4G and has a microSD card slot to boost the internal memory (which stands at 8GB). Cards are capped at 32GB though, so you can't turn this into a 256GB monster.